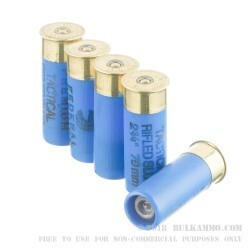 A reduced recoil slug that’s an incredible bargain for all day training or for hunting, duty or home defense. When lower recoil matters but super long range shooting doesn’t, this is an excellent choice that costs so little that you can justify storing away a ton of it. 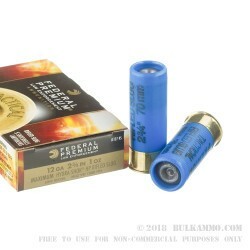 The 2 ¾” shell features a 7/8 ounce slug, rifled, for use in a smooth bore shotgun barrel. 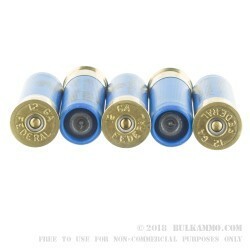 These are made only for short or moderate slug shotgun ranges, usually less than 125 yards, and are probably best suited to 20-50 yards ideally. 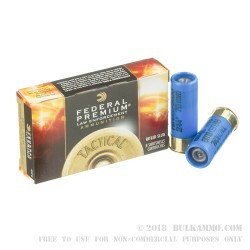 The accuracy, stopping power and efficacy of the projectile are substantially similar to regular power rounds at these ranges and give this round a particularly good reputation for close quarters use or for short range hunting and duty purposes. Slugs of this type with a reduced recoil and weight are still excellent choices for heavily wooded areas where big game stalking can make sense at 25-50 yards. The 383 grain projectile is still quite substantial and offers a nice bit of versatility to your shotgun. 1300 feet per second out of the muzzle delivers excellent energy on target in the form of a hefty lead slug. Gets the job done. Saves your shoulder.